There's an inch of snow on the ground outside. Although that's hardly enough to impede daily life, it's the perfect excuse to hibernate with some comforting food, like homemade ravioli. I made this last summer during Hurricane Irene, a time I needed some comforting of my own, since the storm meant the cancellation of the last 3 days of my beach vacation. I sought to console myself by trying out the pasta roller attachment I'd just picked up at the beach outlet kitchen store. Making your own pasta isn't nearly as complicated as I'd thought it would be. You don't even need a fancy rolling machine, since you can roll pasta out by hand. It just makes it easier, particularly for ravioli, where you'll have better results with something uniformly thin. I used this three-piece set of attachments for a Kitchen Aid mixer. The roller attachment is the most important, which you use to flatten pieces of dough through several passes with gradually thinner settings. The other two attachments are for cutting fettuccine and linguini. Sure it takes more time to make your own pasta, but it's not so time-intensive that it cannot be done even for a weekday meal. 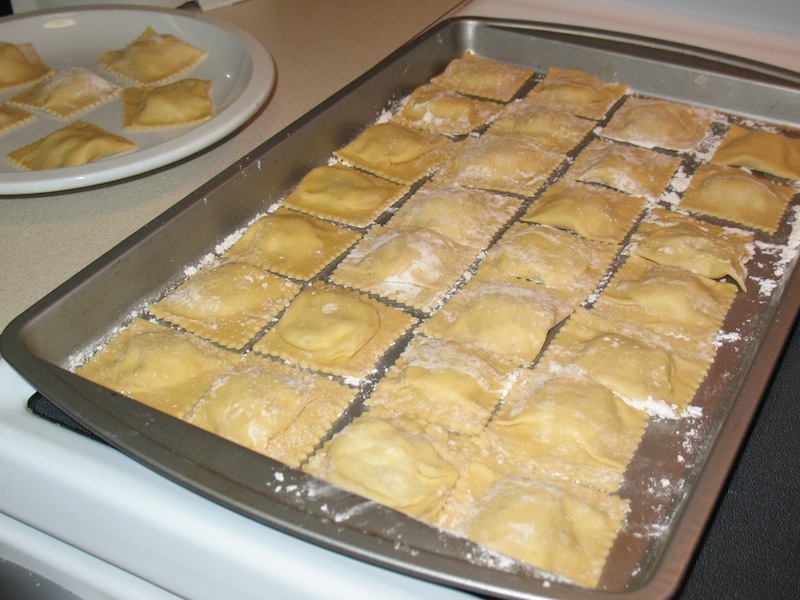 It does take awhile to assemble the ravioli, as you make about four at a time. Be sure not to cram too much filling into each raviolo; a rounded teaspoon is enough. Get them all ready to go before boiling them. Heat olive oil over medium heat in a large frying pan. Saute garlic and sage until fragrant. Add sausage and continue cooking, breaking up with spoon until cooked. If desired, set aside some cooked sausage to include whole in the sauce. Transfer cooked sausage mixture, add ricotta cheese and pulse until well mixed. Transfer mixture to bowl and refrigerate if not using immediately (clean food processor before step 2). Add flour to food processor and pulse a few times. Add eggs and process until dough comes together into a ball. Put dough on dry surface and cover with plastic wrap to rest at least 15 minutes (to 2 hours). Refrigerate if not using immediately. Slice red pepper into wide strips. Toss pepper strips and tomatoes (if not using canned) with olive oil and spread on baking sheet. Broil on high about 4-5” from broiler until vegetables are lightly blackened. Set aside to cool and then puree (with tomatoes if using canned) in food processor or blender. Meanwhile, heat butter in a small saucepan over medium heat until melted and foam subsides. Add shallots and sauté until softened. Add pureed pepper/tomato mixture, cream, brown sugar, salt and pepper, half of the basil, and any reserved sausage. Simmer on medium-low while making ravioli. Heat large pot of salted water to gentle boil. Roll dough out until quite thin (#5 on a Kitchen Aid pasta rolling device). Cut into large rectangles about 6 inches wide and 4 inches tall. Place rounded teaspoons of sausage mixture onto dough about 1 inch from bottom and about 1.5 inches apart. 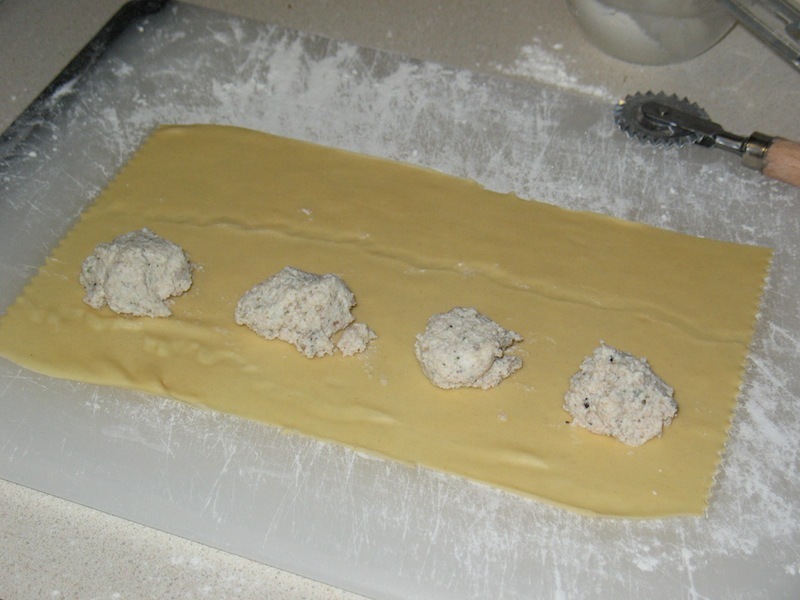 Fold pasta over, seal edges and cut with dough cutter to form ravioli. This should make about 30 ravioli. Cook ravioli in two batches: drop into boiling water and cook about 5 minutes; remove cooked pasta with slotted spoon. Place about 7 ravioli in a pasta bowl. Top with a generous spoonful of sauce, a sprinkling of fresh basil and parmigiano-reggiano as desired. I know this was a lot of work, but boy was it worth it. Yum, yum, yum. 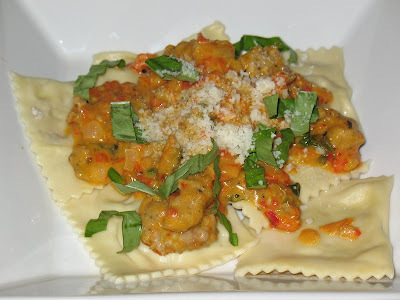 I'd like to make ravioli again sometime soon. Something with butternut squash and spinach would be good.